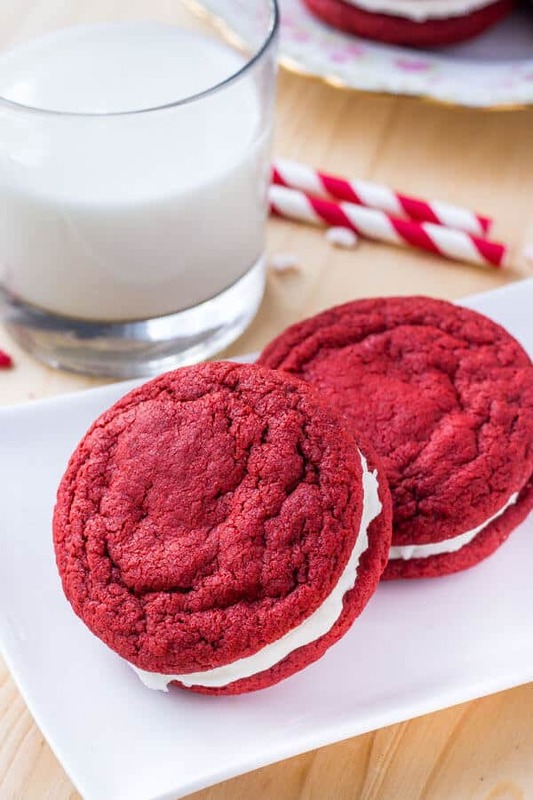 If you love red velvet, cream cheese frosting, and eating 2 cookies at once – then these red velvet sandwich cookies are for you. Made from scratch, and perfect for Valentine’s Day. 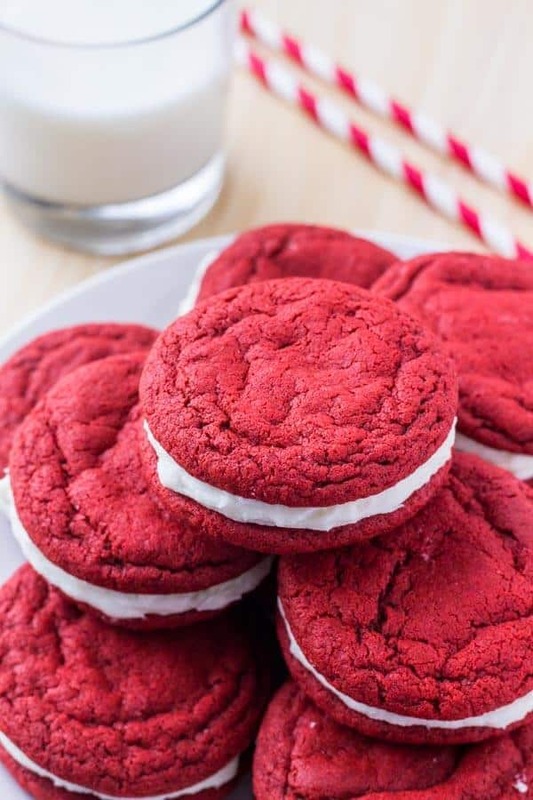 These red velvet sandwich cookies are a soft, chewy, homemade version of red velvet Oreos. 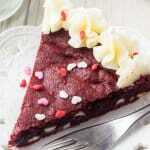 They have a delicious hint of cocoa, vibrant red color, and tangy cream cheese frosting. Plus – you get 2 cookies in one. Which is always a very big plus in my book. If truth be told, I’ve been tinkering around with red velvet cookie recipes for months. I’m not trying to cheat on my favorite red velvet chocolate chip cookies or anything. 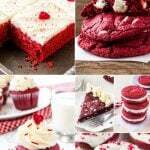 It’s just that I wanted red velvet cookies with a really vibrant, beautiful red color so they’d be completely picture perfect. And I really wanted to make red velvet cookies smothered in cream cheese frosting. 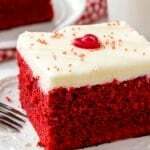 Because red velvet cake isn’t complete with cream cheese frosting. So I’m pretty sure our red velvet cookies deserve some creamy, tangy goodness too. Seriously – you’ll be in love. Ok – let’s talk specifics. 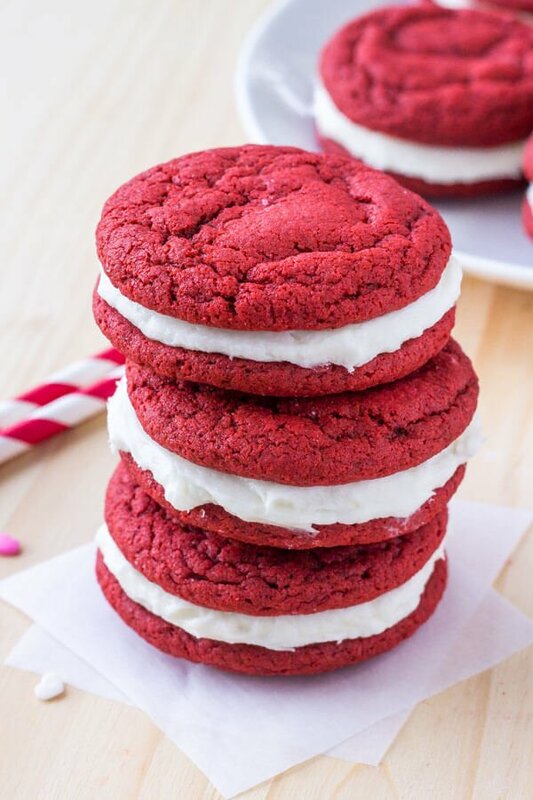 These red velvet sandwich cookies are made from scratch – but seriously, they couldn’t be easier. Whisk together the dry ingredients: flour, cocoa, cornstarch, baking soda and salt. Pssst – cornstarch makes them extra soft. In a separate bowl, beat together the butter and sugars. Then mix in 1 egg, vanilla extract, red food coloring & vinegar. Vinegar is key for that slightly tangy red velvet taste. Then slowly beat the flour mixture into the butter mixture. After that, it’s time to form the dough into balls and bake in the oven. You don’t have to chill the dough (YAAAAAAAAS) – but I definitely recommend using a cookie scoop. 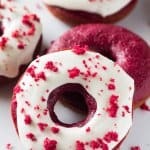 The dough is pretty sticky, and the red food coloring can make your hands pretty dirty. Then after the cookies are done baking, it’s time for our cream cheese frosting. Seriously, it’s divine. Completely creamy, slightly tangy, and perfect for sandwiching 2 cookies with. 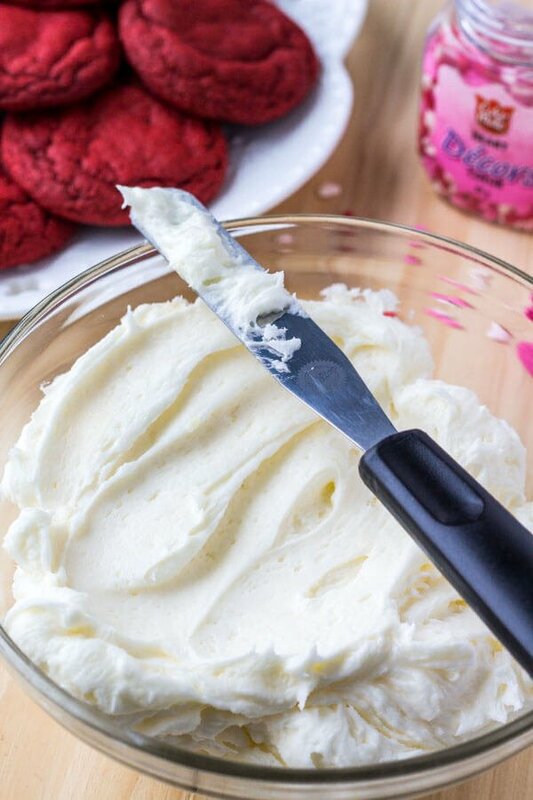 For todays cream cheese frosting recipe, you’ll notice I added a little shortening in addition to the traditional butter & cream cheese combo. This makes the frosting a little brighter white, plus it make it a little sturdier. If you don’t have shortening on hand – you can definitely substitute it for more butter though. 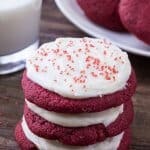 So whether it’s Valentine’s, Christmas, or you’re just in the mood for some red velvet on a regular Friday – these red velvet sandwich cookies are definitely worth turning on your mixer for. 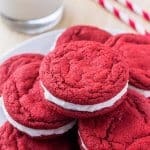 If you love red velvet, cream cheese frosting, and eating 2 cookies at once - then these red velvet sandwich cookies are for you. Made from scratch, and perfect for Valentine's Day. In a medium bowl whisk together the flour, cocoa powder, cornstarch, baking soda and salt. In a separate bowl beat together the butter, white sugar, and brown sugar. Then mix in the egg, vanilla extract, vinegar and red food coloring. Slowly beat in the flour mixture about 1/2 at a time. Form the dough into balls about 1 tablespoon in size (I recommend using a cookie scoop) and place 2 inches apart on a cookie sheet lined with parchment paper or baking mats. Cook for 7-9 minutes or until the tops look just set, remove from the oven and cool. In a large bowl beat together the butter, shortening and cream cheese. Slowly beat in the salt and powdered sugar until the desired sweetness is reached. If frosting seems too thick, beat in 1 tablespoon of heavy cream. Make sure the cookies are completely cooled. Frost the bottom of one cookie with frosting and sandwich a second cookie on top. Repeat the process with the rest of the cookies. * Use gel or liquid food coloring. I used gel for these photos. **Frosted cookies can be kept in an airtight container at room temperature for up to 3 days or in the fridge for up to 5 days. Okay, need it to be February ASAP. These look INCREDIBLE- cannot wait to try! I don’t think I can wait for Valentine’s Day to make these. yum! These are amazing!! My new favorite cookie! !